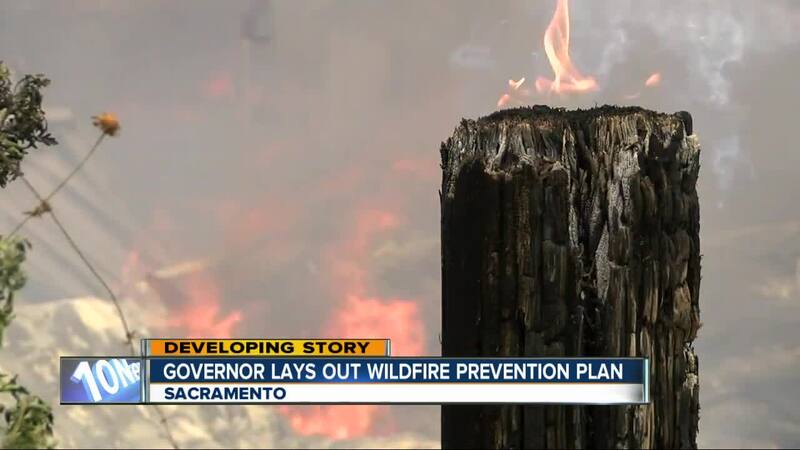 Wildfire prevention plan released by the governor. SACRAMENTO (KGTV) - Wildfires are more dangerous and costly than ever, according to California Governor Gavin Newsom's strike force team's report released Friday. "We are in a very precarious state," he said at a press conference. He highlighted 5 main points in the report, the first pertained to preventing and fighting catastrophic wildfires, "213.6M of that was specific for fuels reduction." Millions in the budget dedicated to clearing brush and other potential fire hazards on private and public land, build the workforce to do it and invest in technology to monitor fire risk. "There's the world without climate change, here's the world we're living in," Newsom said referring to a chart showing skyrocketing wildfire damage in terms of acres burned, in recent years. He said he wants to break the cycle, creating more clean energy to reverse the effect of climate change, focused on electric cars and utility companies. "The soaring costs of wildfires, the good old days and now the new normal," Newsom said referring to another chart showing the jump in costs related to wildfire damage. The governor's plan outlined options to pay for wildfire damage, including helping utility companies if they're at fault, and spreading costs among everyone, including tax payers. "The state has suffered from their neglect," Newsom said taking aim at utility companies. He wants the California Public Utilities Commission strengthened, to hold utility companies accountable while passing wildfire damage costs to customers. "SDGE which is in that San Diego area, which is a credit rating just above junk bond status, one fire away from going into junk bond status," he said. While we are still reviewing the Strike Team’s 52-page report, we applaud Gov. Newsom for his leadership and his sense of urgency in addressing critical wildfire policy issues. The strike team’s report highlights many important issues, and we look forward to being part of the conversation to help address the state’s wildfire risks. “Any solution that is presented to the Legislature for approval needs to adequately protect the interests of all Californians, and should take into account the significant investments our region has made over the past decade to protect our communities from devastating wildfires. “There is still work that needs to be done to reform the regulatory, legislative, and policy structure to adequately reflect the challenging wildfire and climate change conditions and possible liabilities. The governor also called on Congress to act, saying he's giving them 91 days to pass his legislative package.